Beautifully-proportioned and spacious residence in the heart of peaceful Beaconsfield. 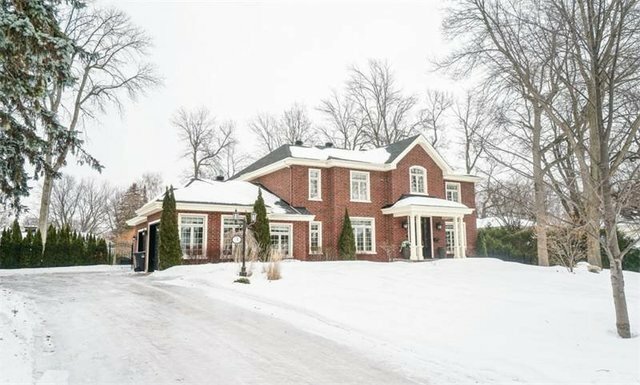 The elegant red brick exterior matches the impeccably-finished interior: rich use of fine woods and stone, the vast and spacious rooms make the perfect home for a large family. 3 garages, double lot, exceptional layout, all in turn-key condition. ***DESCRIPTION***Main floor*The main hall with soaring ceilings welcomes you in the most distinguished of settings*A cross-hall configuration elegantly divides up the front of the house between the formal dining room and open office*The back of the house gives onto the expansive backyard and features an absolutely massive U-shaped kitchen: top-of-the-line appliances, enormous centre-island, all the workspace an army of 5 chefs could need and with a superbly useful dinette. *The family room allows access to both the kitchen and backyard, and will likely become your family's hub. *A functional mudroom lies adjacent to the 3-car garage and also accesses a powder room.Second Floor*The second floor features four exceptionally spacious bedrooms as well as two bathrooms. *The master suites gives onto the picturesque and private backyard and features a large and luxuriously-appointed en-suite as well as walk-in. *The other three bedrooms offer ample proportions and share a very large family bathroom.Basement*Almost another residence in and of itself, the soaring ceilings, two bedrooms, possible kitchen area and massive family room make for an exceptional basement. ***DECLARATIONS****The choice of the building inspector shall be approved by both parties prior the inspection. *All fireplaces need to be verified by the buyer & are sold without any warranty with respect to their compliance with applicable regulations & insurance company requirements. *The living area has been taken from the city assessment roll.